My body was grudgingly getting used to the short days and long nights of winter. Sitting up in my sleeping bag, leaning against my pack, looking out the boxcar door... and thinking back to the summer when it would be warm and bright outside at this hour. For all I knew it could have been midnight, but I was afraid to look at my watch... fearful of finding out that it was only 4 or 5 o'clock. Time-wise I was half way through my journey from Oakland to Salt Lake, as it usually takes about 24 hours and I had caught this train roughly 12 hours ago. I was sitting on a siding just west of the Chilcoot tunnel, maybe 20 or so miles east of Portola, and my train trip had definitely ground to a halt. I could have grabbed the piggyback train I usually take on this trip but there was something about the weather that made me let it go by and wait for a junker instead. I wasn't in any kind of a hurry, and aside from the uncomfortably abbreviated sleep in the bushes outside the Oakland Western Pacific yard I was feeling pretty good, thanks to a warm sleeping bag, a large chunk of cardboard, and a supply of the latest nouveau White Port from the esteemed cellars of Ernest & Julio Gallo. Taking stock of my situation, I realized that aside from the inherent anxiety of not going anywhere I was in pretty good shape. I had a comfortably riding boxcar, plenty of food and drink, and I probably had a better sleep once I got on this train than I did the night before in the bushes. I mentally began to break down various details into pluses and minuses, ending up with the lack of movement from being on this siding and possibly the weather being the only two in the "minus" column. Once it was made evident that I had no control over either issue, the "great weight being lifted from my shoulders" epiphany was achieved, and I began to fade back into a delicious stupor as I accepted my predicament and embraced it. Fortunately there was no wind to torment me by rattling every loose piece of metal nearby — just the steady pitter-patter of raindrops on the roof of the boxcar, and a few that made it inside thanks to holes here and there. Occasionally there would be a hissing of air from the brakelines, or a crunch from some amount of slack creeping one way or another, but mostly it was the rain that kept me entertained as I sipped from the bottle of Port and withdrew from any thought of motion. Since the darkness prevented me from seeing anything outside the boxcar, and I knew that it was way too early to actually roll out and go to sleep, I just closed my eyes and basked in the feeling of not caring one way or another if we ever started moving again. During a period of deep contemplation spurred onward by my wine diet, I noticed that the raindrop noise had stopped. Opening my eyes to verify that it had indeed stopped raining, I was chagrined to see a coating of snow in the doorway framed by almost horizontal snow streaking by outside. This change in the weather depressed me almost immediately — not because snow is usually placed lower than rain on the "enjoyment" rating, but because without the "noise" of the rain I felt somehow cheated because the snow brought along nothing to amuse me with. The sound of the rain at least provided me with an indication of a change in the intensity, but the snow made the same non-sound whether it was snowing lightly or there was a raging blizzard outside. Additional sips of Port allowed me to forget about the lack of external noise and concentrate on whatever stimuli I could identify, as the buildup of snow outside seemed to transform by boxcar into an anechoic chamber — almost completely dark, motionless, and now noiseless. Before I withdrew into the feeling of "nothingness" any further, I reached around to my pack and got out my flashlight to provide me with a link to the "here and now" if I had to get up to pee. I began a game of holding the flashlight above my head and flicking it on and off again very quickly, almost as if I was illuminating the inside of the boxcar with an electronic flash. This provided a high level of enjoyment as I watched brief images of the snow-covered doorway appear and slowly disappear. At one point I watched the lights of a vehicle go by on the distant highway and decided to stop my flashlight game before it became a signal for help in some passing motorist's eyes. Yearning for some other form of amusement, I took one last sip of wine and invented yet another "game". My boxcar was elevated slightly on the side opposite from me, so I poured out the last drop or two from the wine bottle, then I turned on my flashlight and slid it into the bottle, then replaced the cap. Starting on the floor beside me, I rolled the illuminated bottle a few feet away from me, then watched it stop and roll right back. I was ecstatic! Careful not to roll it too far away, I spent a considerably amount of time watching the bottle begin and end it's short journeys under my masterful control. I envisioned how it might be if the train was moving and the bottle was allowed to roam around freely on the floor of the boxcar, controlled only by the rocking of the train. Alas, at some point I was startled by a bright light outside, and realized that whatever train we had been waiting for had finally manifested itself on the track next to my car, even though I never heard it approach. Now able to see the intensity of the snowstorm, I was truly glad that I didn't take the earlier hotshot. Retrieving my sticky flashlight, I stood up and waddled toward the boxcar door to pee, with my legs almost non-responsive from sitting motionless for so long. Now "officially" rolled out, I re-entered my sleeping bag as the welcome sound of air in the brakelines meant that I was not alone in the snow-covered sagebrush. A gentle tug reinforced that feeling and in a few seconds I was aware of noise and movement again. 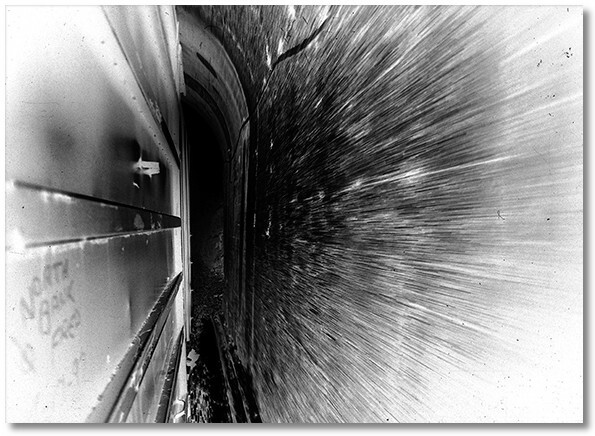 The noise increased as we entered the short tunnel and I soon entered Nevada and the world of train riding once again.